I have forgotten what toddlers are like – or maybe Norah just wasn’t as busy as Lucy, but oh my goodness! Lucy doesn’t sit for long – well, except to read books. She is on the go all the time and she has no fear, which is totally different than Norah. Norah has always been reserved and hesitant. If I turn my back for 2 seconds, Lucy is climbing on the arm of the chair in position like she is about to jump off! Right now, Norah is with my parents at my sister’s so Lucy has the run of the house. She has been running circles since she woke up from her nap. She pulls all the books off the shelf, dumps out the Little People, dumps the blocks and turns the TV on and off. As soon as I get everything picked up, she does it again. She will sit for a few minutes at a time if someone is sitting with her. I can distract with a book – she has about 4 favorites – but then she wants me to read the book about 20 times in a row. Whew! She wears me out!! Lucy is a very happy little girl and she sleeps great at night so I think I can handle the activity! Just wanted to tell you about a Bible study that I just started. It’s an online Bible study called Believing God by Beth Moore. It is great! You download and watch a video clip and then you download the weekly homework, broken into 5 days. If you have ever done a Beth Moore study you will know that she is a very dynamic speaker and really speaks to each person personally. I hope you’ll check out the Believing God Web site (http://www.lifeway.com/believingGod) and see if you’d like to join us in this study. You can enroll right there online. 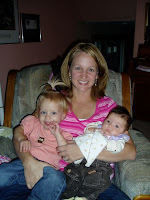 My friend, Cherie, has set up a blog for weekly discussions. She is going to post a question or thought and is encouraging anyone doing the study to post comments. I am really excited about this study because I am not able to do the women’s Bible study at church (picking Norah up from school conflicts with that study). I can do it all on my own time – but I am still in the Word. Is it Fall or Summer – I don’t know!! Yesterday, the girls and I had to deliver Usborne books to my sister in Clayton and Kevin’s brother’s child care center in Richmond Heights. Since we were making the hike into “the city,” we went to the zoo first. I LOVE going to the zoo during the week, during the school year because it is never busy!! It was warmer than I expected, but the girls had a blast. Lucy was totally excited about the elephants and the giraffes – I think she actually recognized them from some books. Norah’s favorite thing was the primate house. There were 2 monkeys chasing each other and she thought that was hilarious. After we delivered the books, we went to lunch with my sister. After multiple diaper changes – we finally headed home about 1:30. Lucy slept on the way home for about 30 minutes and Norah did not sleep at all. I convinced Norah to nap when we got home, but Lucy was apparently done napping. We had 2 babysitters (sisters) come over last night while Kevin and I went to the Cardinal game. Ummm . . . what’s the deal with our Cardinals? The game was not very exciting – the pretzels were great, though! When we got home the babysitters said that Norah was asking to go to bed around 8 – it had been a long day! This morning we went to Eckerts in Belleville. Again it was warmer than we expected, but we survived the heat. We went with our friends, the Harpers. Norah and Kate rode a couple of rides, fed the goats, road the ponies and ate lots of food. We never actually made it out into the orchard to pick apples because the girls were ready to crash. Both girls fell asleep today, but only for about 30 minutes so we are in for early bedtimes! Now the girls are playing dress-up – surprise, surprise! Kevin and I are just sitting – trying to catch our breath after a couple of busy days. Just going through our normal everyday stuff. Norah went to school this week and she is doing great! We are so proud of her! She actually said she wants to go to school all day, everyday – and on the bus, too! I don’t think she really knows what she is saying! She brought home this picture today. Notice the hair on all of us – “Lucy has a ponytail in the middle,” Kevin has “short, spiky hair,” Norah and I have “long straight hair” – quite detailed! Norah also has been experimenting with her markers – she has never done this before. I thought it was more of a 2 year old behavior, but whatever. We made her scrub the chair herself – sadly, she thought it was fun. I should have her scrub the bathtub, or maybe the floor!! 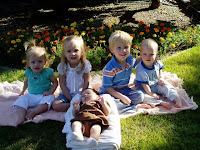 We babysat 2 little boys yesterday – 4 mo. and 3 1/2. Things actually went fairly smooth. At one point the baby was the only one awake. I slept better last night than I have in weeks! One last picture – Lucy’s hair! What am I going to do! This is from the humidity! We spent the last several days in Morton for the annual Pumpkin Festival! 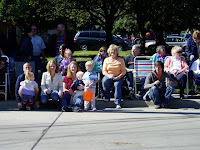 It is fun every year for us to go to my parents for the parade and all the festivities. Norah and Ryan are at great ages to enjoy everything – well, most everything. Norah was not a big fan of the mini – rollercoaster. Actually, she screamed her head off. She also was not a big fan of the crowds and the noise. Wednesday afternoon we went to Ackerman Farms to check out the pumpkins and animals. Lucy has gotten very good at barking, however, she barks at all animals – not just dogs. Wednesday night Denise, Contessa, Norah and I went to the Pumpkin Princess Pagent. I thought Norah would love it, but she was a little overwhelmed with all the people. The little girls were very cute. We went for ice cream, then headed home. Max and Denise live just a couple of blocks from downtown – where the PF takes place – so we parked at their house whenever we went down. Thursday morning, I had breakfast with a friend while my mom watched the girls. Later Alison and the boys came to town so the kids hung out and enjoyed being together. Kevin also came into town (on the train) on Thursday night. The girls were very glad to see him!! 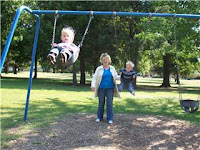 Friday, Norah, Ryan, and Will went to the park with Grandma Jackie and Alison. Rick joined then later for lunch – apparently Norah talked his ear off. Kevin, Denise, Contessa, Lucy and I went to Peoria to pick up Denise’s car (it died on Max earlier in the week). We grabbed lunch then headed home. Friday evening, Kevin, Norah, Alison, Ryan, Denise, Contessa and I went to the PF. The kids rode some rides and checked out the pumpkins in the pumpkin decorating contest. We grabbed the famous pork chops from the food tent and headed home until the kids went to bed. Denise, Max, Kevin and I headed back to the PF for a little while. I am a total wimp these days when it comes to rides. We rode the Pharoah’s Furry (which took 2 tickets per person so basically $18 for all 4 of us) and I thought I might puke. I didn’t, but others said I was a wimp because I closed my eyes and held on as tight as I could. LOL. I enjoyed a piece of pumpkin pie before heading back. Kevin had a pumpkin cookie and Denise had pumpkin ice cream. This morning was the 10K. My goal was 62 minutes and we ran it is 59:30! My legs are tired and sore now, but I am glad we did it. Kevin was great to stay with me – I don’t know that I could have kept the same pace the whole time. We headed to my parents for pumpkin pancakes and then we were off to the parade. The kids collected way to much candy. Ryan was much more aggressive at catching candy, but he was very kind to share with Norah. We had lunch at my grandma’s and then headed home. The girls traveled very well today. Kevin went to the Cardinal game tonight. Tomorrow, after church, we are going to have a very lazy day!! We have had a crazy week! I will post details probably tomorrow, but for now, just touching base. My 10K is tomorrow!! I think I am ready for it. My goal is to run it in under an hour. I’m sure that seems slow to some, but good enough for me!! If you haven’t seen this – A Native’s Guide to St. Louis – check it out on my sister, Alison’s blog. If you live or have lived in St. Louis – you will find this very amusing! !